Adam Waddell became a member of the Arkansas Public Transportation Council when he was sworn in on Aug. 23. Through his involvement in state transportation issues, Adam Waddell of the University of Arkansas Transit and Parking Department can now have a bigger impact as a result of moving in to two new roles. 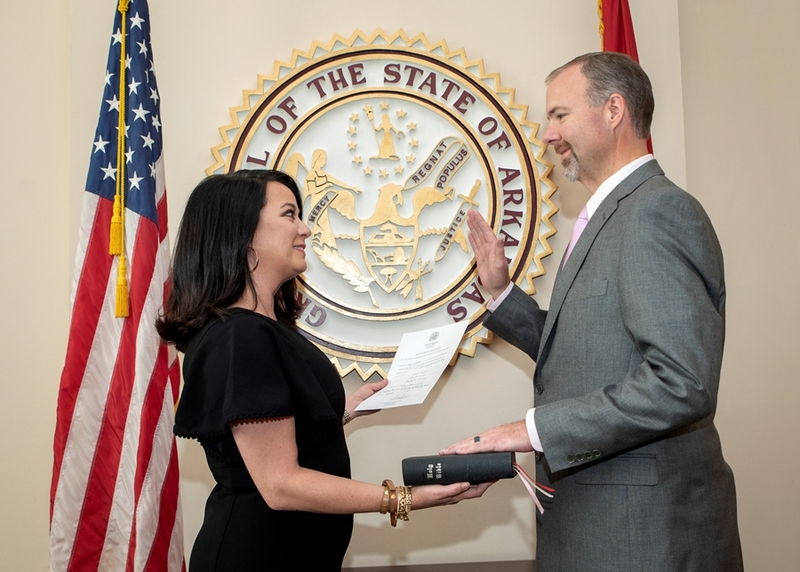 On Aug. 23 in Little Rock, he was sworn in as a member of the Arkansas Public Transportation Council, which operates within the Arkansas Department of Transportation (ARDOT). He was appointed to that council by Governor Asa Hutchinson in May. Waddell is Transit and Parking's associate director, and supervises all operations for Razorback Transit. He was also recently elected president of the Arkansas Transit Association's Board of Directors. He was vice president before that. Waddell sees his involvement in the two state roles as an opportunity to help in transportation matters throughout Arkansas. "I'm glad to be able to have an impact on issues across the state," he said, "to further initiate efforts that will improve transportation." Waddell has been in the Transit and Parking Department for 20 years and has headed Razorback Transit since 2012. According to a statement from Greg Nation, Public Transportation Administrator at ARDOT, Waddell's background will enrich the work of the transportation council. "Adam's experience with public transit and the needs of urban transit providers will be an added benefit to the council," Nation said. Waddell's term on the council will expire on Sept. 20, 2021.